Downtown Dallas, Texas | ride. travel. live. I had a long layover in DFW Airport, and instead of wandering around the rather grim, disorienting halls of the airport, I took the DART light rail into downtown. It’s a 45- minute ride into town, made confusing by construction downtown that terminated the trains just north of downtown, in the up-and-coming Victory Park neighborhood. 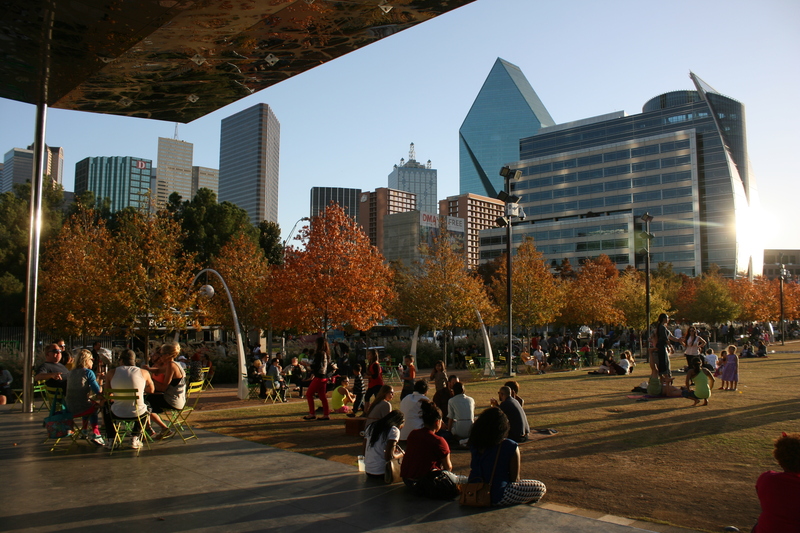 It’s a big contrast to the sprawl of Houston, and downtown Dallas seems to have achieved a critical mass of residents, a lot of things to do, places to eat, public transit, and has turned itself into a very pleasant area. I was at a loss as to what to do in downtown Houston, as it seemed like it was only a business district, with very few things for people to do outside of business hours. Dallas has avoided this with a concentration of pedestrian-friendly sights and activities downtown, starting with the renovated buildings of the West End and the sights surrounding Dealey Plaza. 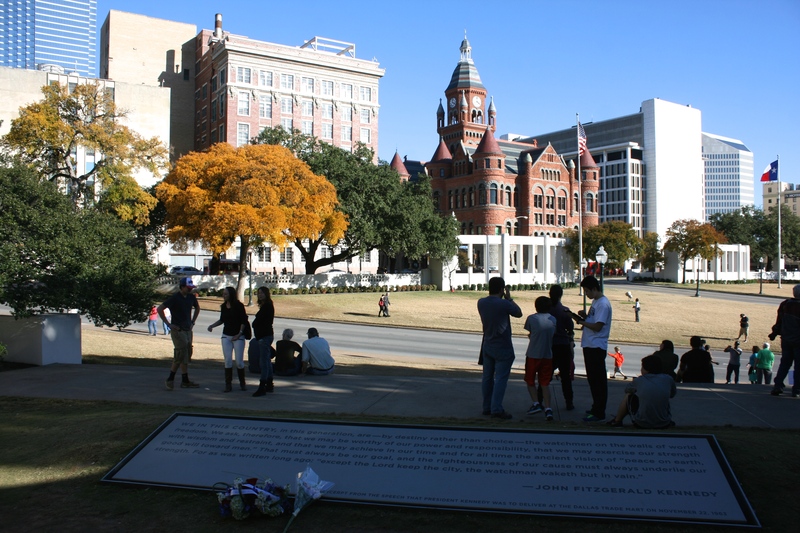 Since I visited around the anniversary of JFK’s assassination, the area was very busy with visitors, mixed in with several people espousing on the latest conspiracy theories about Kennedy’s killing back in 1963. Yes, the furor never will die down, and the area was a mix of memorial and circus. In fact, it looks little changed since 1963 as viewed from that infamous grassy knoll (marked as such), with the exception of the Reunion Tower. Much of the development in downtown is to the east and northeast of Dealey Plaza, and the plaza itself is a busy automobile thoroughfare with structures dating from the late 19th to mid-20th centuries. 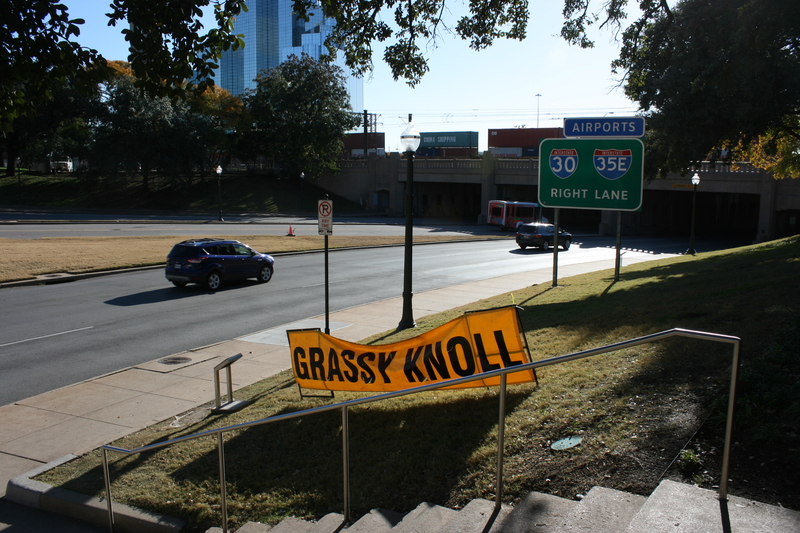 Grassy knoll, looking west. This is roughly where Abraham Zapruder stood filming. Further afield is downtown proper, a fairly distinguished grouping of skyscrapers straddling two offset city grids. Retail is slow to return downtown, but there was a fair number of people walking around, thanks to a strong effort at making it pedestrian-friendly. The showcase of downtown is the Arts District. If anything, this part of town is an American downtown done right. It’s anchored by Klyde Warren Park (2012), which is a three block large park on top of the freeway. It’s amazing what replacing a traffic-choked, litter-strewn overpass can do for making a cohesive city. By creating the park and covering the freeway, two disparate neighborhoods have been joined. There are of course other examples out there, but it’s a great piece of urban planning, and it was crowded with people on this sunny Sunday. 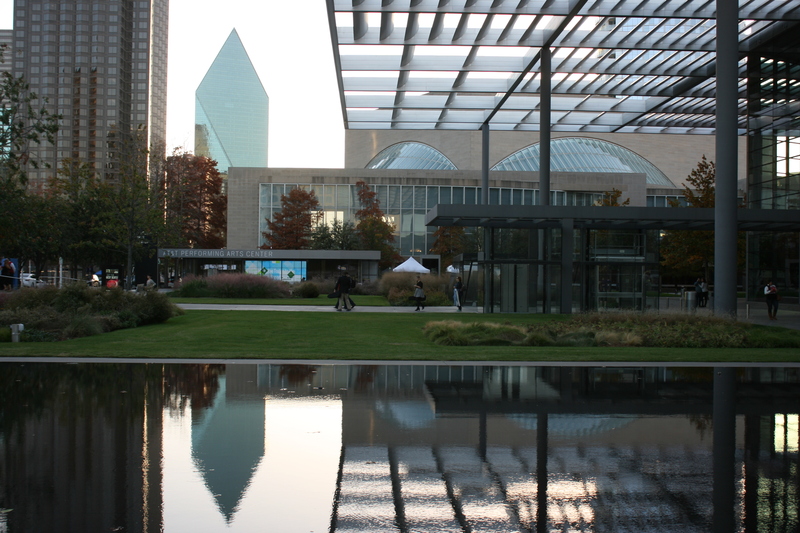 Around the park are the major performing arts venues of Dallas, a top-class collection of buildings such as Meyerson Symphony Center (I.M Pei), the Dallas Museum of Art, the AT&T Performing Arts Center, the Nasher Sculpture Center (Renzo Piano), and others. Well done, Dallas, I’ll visit again.